"Rice infused with garlic and onion baked in chicken stock. A wonderfully simple dish even picky eaters will enjoy. I use homemade stock as it's the most flavorful, but use whatever you have on hand. Another option is adding whatever leftover veggies or meat I have to make a simple casserole without a heavy cream sauce. 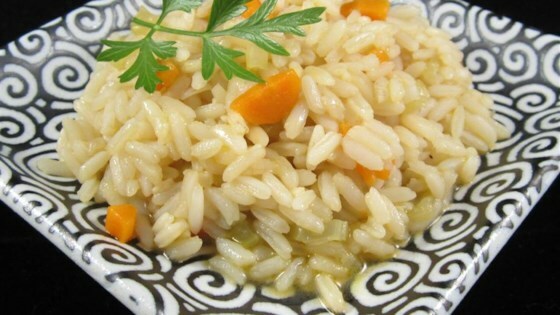 This recipe uses a rice-to-liquid ratio of 2:1 for long-grain rice." Preheat oven to 350 degrees F (175 degrees C). Prepare a 2-quart casserole dish with cooking spray. Spread long-grain rice into prepared casserole dish. Heat olive oil in a saucepan over medium heat. Cook and stir carrot, celery, and onion in hot oil until onion is soft and translucent, about 4 minutes. Stir garlic into mixture; cook and stir 1 minute more. Increase heat to high; add chicken stock and bay leaf to the saucepan and bring to a boil. Pour the mixture over the rice in the casserole dish. Cover the dish tightly with aluminum foil. Bake in preheated oven 20 minutes. Remove aluminum foil and continue baking until the rice is tender and has absorbed most of the liquid, about 20 minutes more. Remove and discard bay leaf; season with black pepper. Fluff with a fork to serve. Comes out perfect every time! If you like drier rice, uncover the rice after the 40-minute mark and let bake 5 to 10 minutes more to allow the rice to dry out a little. My guys really liked this super simple baked rice. I liked the ease of the recipe. You could add whatever vegetables your family enjoys to this dish. it was good and all, but tried the same recipe again the next evening with slight modifications. I also added 2 large pork ribs to the baking process it came out superb.. This rice tasted amazing. I added red and green pepper and the dish was so colourful I just wanted to look at it . Serve with chicken wings and everyone loved it . Not a grain of rice left.